Peaches and garlic. It’s a serendipitous combination that could only be found at the Santa Fe Farmer’s Market. Peaches Malmaud, 66, moved to the Southwest in 1970 to teach ceramics at the University of New Mexico, but shortly after her arrival she had a change of heart. Her passion had shifted from molding clay to cultivating crops. Malmaud feels that life down on the farm is her true calling, an artform in its own right and a lifestyle that keeps her connected to the earth. 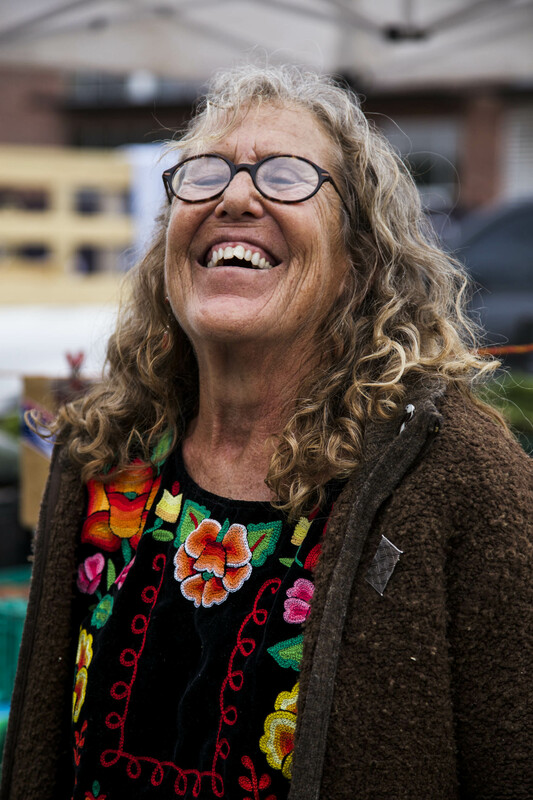 Peaches Malmaud laughs while she sells her handmade garlic oil at the Santa Fe Farmer’s Market. Malmaud has been farming in Placitas, New Mexico for 15 years. After a failed crop of amaryllis early on in her agricultural career, Malmaud felt that choosing a more resilient bulb would be a good idea. She went with garlic, a choice that has worked out quite well for her. Her Valley Garlic Oil business employs three full-time workers during the June harvest season, and droves of Malmaud’s labor-ready friends show up biannually to help plant and pluck the garlic. Malmaud touted garlic’s multitude of medicinal properties, along with its seemingly endless culinary uses. Her face beamed with a wide smile as she explained the possibilities of just one garlic clove. The garlic oil that Malmaud produces is a highly concentrated elixir, derived from dozens of cloves per ounce. The oil production process, from field to bottle, takes about a month. It follows a series of steps beginning when the garlic is harvested in mid-summer. The cloves are then separated from the bulb, mashed, mixed with extra virgin olive oil on a 1:1 ratio, based on weight, and thoroughly filtered several times before bottling. In an effort to minimize waste, Malmaud feeds her chickens the exhausted garlic cloves, a byproduct from the oil production and a natural antibiotic source. “It’s a kind of nice process of utilization,” Malamud said. Local vendor Anna Booth, of Gemini Farms, tends to the produce at her stand at the Santa Fe Farmer’s Market. 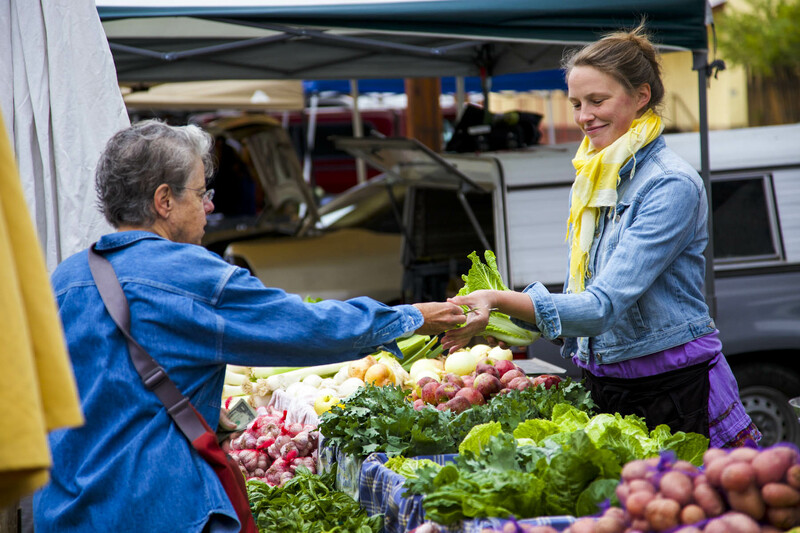 The Santa Fe Farmer’s Market was bustling on a recent Saturday morning. Vendors lined both sides of the smooth, concrete walkway in the Railyard District – a renovated industrial area that is now home to an array of Santa Fean cultural and artistic events. Dense crowds of shoppers huddled around stands, peeking over each other’s shoulders for a glimpse of the colorful and eclectic foods for sale. 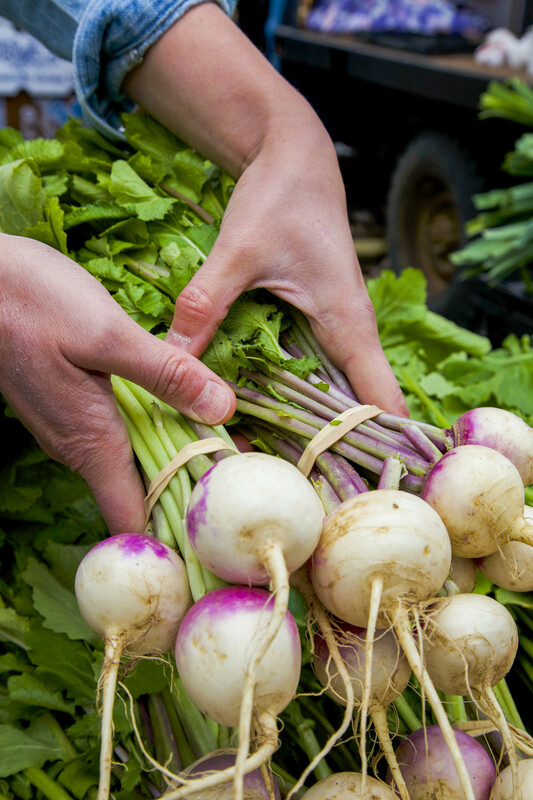 Mounds of dusty purple-skinned potatoes were stacked next to plump bushels of white radishes. The spicy, charred scent of roasted chilis swirled with the notes of a chirping saxaphone being played by a teenaged street performer. Malmaud loves the upbeat atmosphere of the farmer’s market. She has an obvious affinity for the people here. But she never found herself being drawn to Santa Fe itself. She said she’s just not a city person. Standing at the market, Malmaud beckoned to passersby with raised eyebrows and a magnetic smile. She made a new friend with every sale, genuinely thanking them for their purchase while rattling off the oil’s many uses and powers. The deep wrinkles on her cheeks came to life, bending into happy lines across her face as she let out a deep, raspy laugh. Her passion for this savory-scented bulb is nearly contagious. She likened its pungent aroma to that of ambrosia. It could be her lovable demeanor, relaxed yet calculated sales pitch or the undeniable quality of her product, but if you stop at Peach’s stand you will most likely be walking away with your very own bottle of her garlic oil. However, whether you stop for the oil, to chat with Peaches herself, or both, you’ll surely be taking away something that will treat you well for many days to come.